Well, um, it appears I haven't blogged since last year... (ha!) I ended up taking a little break from blogging over the holidays and even though I had full intentions of posting a few weeks ago, it just didn't happen. Tons of assessments, report cards, and parent-teacher conferences took over, but things are definitely winding down now! 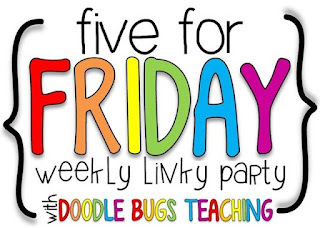 :) I'm linking up with Doodle Bugs Teaching for Five for Friday to share what I've been up to lately. This month in Science, we are doing a unit on the chicken life cycle. We are also attempting to hatch chicks in our classroom. We have tons of chickens on our island, but ironically, I never learned about them in school and definitely never got to see them hatch. I knew I had to try to give my students that experience. I was lucky enough to have the PTA donate an incubator to my classroom last year when I first expressed interest in this project. Unfortunately, none of our eggs hatched last year and I'm pretty sure I made a few rookie mistakes. This year, I was determined to get it right! Two weeks ago, twelve eggs went into our incubator. I have been using a candling lamp (best purchase ever!) to monitor the development... and ten of the twelve are developing! Hatching day should be next Thursday, fingers crossed. My kiddos are so excited! We have also been enjoying many egg and chick themed read alouds. One of the first books we read was Egg Drop by Mini Grey. The kids loved it, so an egg drop experiment was a must! I sent home a note asking each child to bring an egg inside a box. The goal was to come up with a way to prevent their egg from cracking or breaking when dropped from the highest point on our school playground. They were so creative with their ideas! Check out this amazing idea from one of my boys. His egg is actually suspended inside the box using pantyhose and rubber bands! This is the second time I have had a class do this and I have to say that this year's group of kiddos totally outdid last year's! In Math, we have been all about place value. Last week, I introduced expanded form to my students and noticed they were having a difficult time with it, so I knew I had to do something to get through to them. This little movement activity made such a difference! They loved getting to be the parts of the equation and telling each other where to go. We have been learning that the equal sign does not always have to be at the end, so this also helped them to remember that. Right after this picture was taken, I actually wrote "the same as" underneath the equal sign so that we could practice reading the equation using that vocabulary. Later on during their independent practice time, I was so excited to hear a student making sense of the equations by using those same terms as she read them! Priceless! Speaking of spinners and awesome TpT resources, I pulled out this interactive word work page from The Moffatt Girls this week. (Please tell me I'm not the only one who finds it difficult to make whole group phonics lessons interesting!) They were a big hit with my kiddos and I will definitely be using them more often! I think I've gotten so many goodies from TpT over the last year that I tend to forget about the really amazing older resources. This one is definitely an oldie but goodie! I have been inspired recently by all the flexible/alternative seating ideas floating around Instagram. My students usually work at their desks during Writer's Workshop, but I surprised them one day by announcing that several students who had worked extra hard on their writing were now VIPs and could choose to work on their writing in any area of the classroom the next day. Ever since then, the motivation has been through the roof and most of my students have earned their place on the Writing VIP List! As you can see from the photo above, pillows at the carpet is a popular choice! I can't wait to get some clipboards so that they don't have to press down on a book or use the floor when writing. This is another area that they love to write in, but this picture was taken during their Read to Self time. You get the idea though. :) I am blessed to have a variety of seating choices already available in my classroom, so I am really hoping to start using flexible seating for all independent work. For now though, I am easing into it and the kids are enjoying the change. I'd love to hear your thoughts on flexible seating! Do you allow your students to choose their own work spaces in your classroom?